Hardy shrubs, thrive in full hot sun in borders or pots - despite looking exotic,m they are very tough! Great hardy shrub for sunny spots or large pots- feed well when growing, as they are hungary beasts! 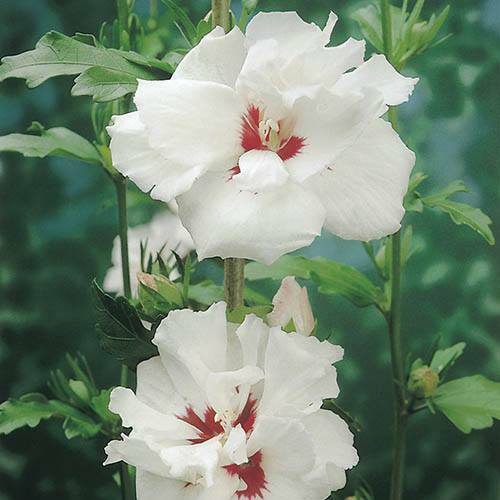 These strong growing, fully winter hardy Hibiscus plants are completely hardy to -15C, despite their delicate flowers and exotic look. They are supplied as a pair of 3 year old potted bushes, ready to plant immediately, and will be smothered in fabulous pink, and white flowers throughout the summer months. Grow in big pots or borders in sunny spots, they will provide a Mediterranean look to your garden, yet return year after year with their gorgeous display. Great value, easy to grow and sure to provide a stunning display. You will get one plant of 'Lady Stanley' (white) and one of 'Ardens' (pink). Supplied as a Pair of 3 year old potted plants 40-50cm tall, in 2L pots. Plant: All year Flowers: July-September Height/Spread: 1.5m (5ft) after 3 years.